When Dean Tran ’97 was elected to the Massachusetts Senate in December, his victory marked a political breakthrough. 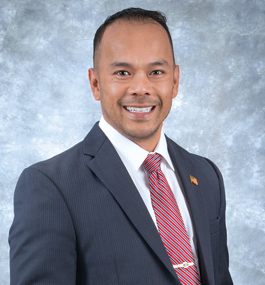 He became the first person of color from his district to serve in that post as well as the state’s first Vietnamese-American lawmaker. Previously, Tran spent 12 years on the city council in Fitchburg, Massachusetts, where he lives with his wife, Kerry, and their four children. At first, he got involved with local politics simply because he wanted to help build a better community for his family, by pushing for more economic development and lower taxes. But over the years, he noticed that his state and federal representatives didn’t really reflect the diversity of the region’s population. He decided to run in a special election held late last year for an open state Senate position. He managed to flip a seat long held by Democrats in an overwhelmingly blue state — a rare feat for a Republican. Tran is used to overcoming obstacles. He was only 2 when his family fled Vietnam in late 1977 following the end of the war, spending every penny they had to secure spots on wooden boats leaving the communist country. “Even now, at age 42, I’m still able to smell that saltwater mixed with old engine fumes,” he says. His family spent two years in a refugee camp in Thailand while waiting for their U.S. green cards to be approved, arriving in Massachusetts in 1980 after being sponsored by a Catholic priest. Life in the U.S. was difficult at first. The family relied on public assistance, and Tran’s father worked multiple jobs to make ends meet. As a freshman legislator, Tran says his top priorities are boosting infrastructure in his district and securing additional school funding. Up for re-election in November, he hopes to set an example for other minorities who want to make a difference. “I’ve always believed that whatever I do would pave the path for people behind me to follow,” he says.